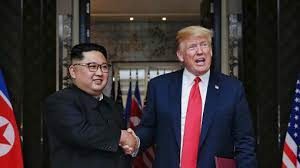 Trump announces second North Korea summit – Royal Times of Nigeria. US President Donald Trump has announced in his State of the Union speech that he will hold a second nuclear summit with North Korea’s leader between the twenty-seventh and twenty-eighth of this month. In an address to the nation with the theme “Choosing Greatness”, he vowed once again to build a border wall. While appealing for political unity, the Republican president also said “ridiculous partisan investigations” could damage US prosperity. His primetime address came less than a fortnight after he backed down to end the longest ever US government shutdown when Democrats refused to fund a US-Mexico border wall. Federal agencies could close again if no spending plan is agreed by the end of next week.